Mike Keneally: "The Universe Will Provide" and "Parallel Universe"
Get 'em both for $20 for a limited time only! This is excerpted and revised/updated from an installment of "Mike Types To You" written on June 23, 2003 (shortly after an early version of the piece was performed at the Holland Festival, and about three months before the making of the album); the revisions, and the section about making the album, were done on August 6 2004. TUWP exists thanks to the hard work and huge heart of Co de Kloet at NPS Radio in the Netherlands. It's the newest creative offspring of the long-standing creative relationship between Co and myself which also gave birth to Nonkertompf Live in 2001, and the Keneally Band's appearance at North Sea Jazz Festival in 2002. Co and my manager Scott Chatfield spent a good amount of time cheerfully working through everything, and I believe that it was November 2002 when the contractual details for the premiere performance of TUWP at the Holland Festival were finalized, allowing me to finally make time to begin composing it. The piece was built by me and Chris Opperman (co-orchestrator, chart preparer and musical assistant for this project) between December 2002 and May 2003. Considering this was my first composition for orchestra (a 50-piece orchestra at that), and that it was to be approximately 45 minutes long, we had to work pretty quickly. For a month and half of that time I was touring in Europe and wasn't able to work on the piece at all (although Chris was able to continue the mechanical aspects of preparing the score while I was gone, staying up long nights while still working full days at his then-regular job - a superhuman feat, folks). 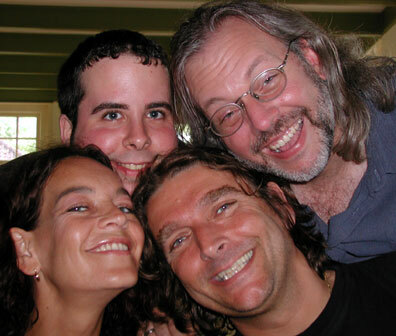 KORTENHOEF, THE NETHERLANDS, June 5, 2003: (Clockwise, from upper left) Chris Opperman, Mike Keneally, Co de Kloet and Josephine Veldhuyzen relax at Co and Josephine's cozy canalside cottage between rehearsals. 1) "Spoon Guy," which existed in manuscript form as the original 1992 arrangement for guitars and bass (recorded for the hat. album), and which was orchestrated verbatim for TUWP. 2) "Bullies," which was a lengthy 1993 manuscript for guitars, keyboards and bass. Only the last page or so of this manuscript was recorded for the track "Bullys (sic)" on the Boil That Dust Speck album; this is the chamber music coda heard after the guitar finally dies away. I extracted and played only a couple of the written parts for the "Bullys (sic)" coda, but that same section, using the full harmonies as written in the manuscript, also forms the last section of "In The Bone World" on Dust Speck. The "Bone World" variation forms the last part of "Bullies" in TUWP (and thus the end of the entire suite), but the complete TUWP arrangement of "Bullies" also contains a lot of material derived from the original 1993 manuscript which hadn't ever been recorded or even played before. "Bullies" as it appears in TUWP wouldn't sound anything like that if it weren't for Chris Opperman, who took the original manuscript and cherry-picked from it at will, putting things in different sequences, constructing repeating motifs and basically going nuts. I edited that work and together we shaped it into completion, but Opperman really put a lot of his creativity into the orchestral "Bullies." and 3) "Room," which I wrote in 2000 while on the road with Steve Vai, did a piano-only written sketch for, and performed once with Beer For Dolphins at the Baked Potato on November 10, 2000. This early version didn't contain the bridge which is on TUWP; that section was newly composed for the orchestra. These three pieces gave us a little head start in putting everything together for this massive project, and there were a few other scattered melodies scrawled on sheet music which I gathered up as well, and which gave us valuable source material at times when I was too exhausted to write something new on the spot. All the rest of the new writing went down in a variety of ways. Most often I would write something down on paper, just like composers used to do. If I was hearing something in my head that was orchestrated a specific way, I would orchestrate on paper. If I was just hearing a melody and not specific timbres or orchestrations, I would jot down the melody, and harmonies if I was hearing them yet, without specifying instruments. I would write down everything in treble clef to get it on paper quickly before it left my head (it takes me ages to transpose), and later on in the computer Chris would do the proper transpositions for the various instruments in a matter of nano-seconds. I composed for a few weeks at my home, at Griff Peters' house and in a few other odd locations, and then brought all the new and old manuscripts and snippets over to Opperman's place, where he typed it all into Finale software. So that became Composition Method One; I write something on paper, Chris types it in, and together we check it out and orchestrate it. If I had already orchestrated it on paper, Chris would type it in that way and we'd check it out. Often Chris would have ideas about what instruments could play certain passages, or ideas about harmonies, or any number of other things, and we'd almost always try his ideas, and sometimes implement them. Often while Chris was typing in one piece, I'd be sitting on the couch writing another. Sometimes I'd write something and ask Chris to orchestrate it himself while I was resting (most of these score preparation sessions began at night and continued until early morning) or continuing to write another passage, and then I'd edit and amend his orchestration. We established a rhythm quickly and started getting a lot of work done. Sometimes I would sit at the computer and click notes directly onto the score, and Chris would clean up my work and make sure it looked nice for the people who would have to read it (the bridge in "Room" and a lot of "Not Just Flutes" was done like that). That would be Composition Method Two, and Method Three would be me playing something on the Korg Triton directly into the computer and having the software notate it ("Mwah Squared" is an example of this method). This was often frustrating when I was improvising and the computer was having conniptions trying to make rhythmic sense of it, but often a great time saver if I already knew the pitches and rhythms I wanted, in which case I would play something one beat at a time on the Korg, and Chris the blazing Finale manipulator would do his thing and make written music out of it. Chris is REALLY fast on Finale, it's crazy. For the album, these movements were re-sequenced and five other movements added. The additional movements heard on the album, "Insert Here I," "Insert Here II," "Mwah Squared" and "When Drums Dream," were composed and/or completed after the Holland Festival. "Quiet?" from the album is the opening section of a proposed revised version of "All Of Them Were Quiet"; it wasn't written to be used as a reprise of the second movement, as it ended up becoming, but once it was recorded I realized it could work beautifully that way. Let's backtrack now to before the writing began; while we were waiting for the business details concerning TUWP to be sorted out, I was conceptualizing and being open to the first feelings which would lead to the finished work. The first thing that came to my mind during the conceptualization phase was "the year 1969." I rolled that around for a few weeks and eventually a couple of feelings bobbed to the surface, the main one being that I would consider this piece to be my birthday gift to my eight-year-old self (my eighth birthday was December 20, 1969). Once I'd gotten that flavor, the idea of me giving the use of this orchestra, this event, this opportunity, to myself at age eight, many other feelings began rushing forth. Most of these are hard to describe, but I kept thinking of things I saw when I was very young - big ones being my first viewing of "2001: A Space Odyssey" when I was seven or eight, and also a futuristic, largely synth-driven stage musical I saw on a class outing when I was around eight, called something like "Help! Help! It's The Globolinks!" or "Here Come The Globolinks!" or something like that. These things fascinated, messed me up and delighted me as a child, and I wanted to make TUWP into something which would have similarly messed up the eight-year-old me, or any other current eight-year-old, literally or metaphorically. There's much more on this topic in Opperman's piece below. In early June, Opperman, Chatfield and I traveled to Holland, where we were wined and dined and treated marvelously. For a mere ten hours over a three day period, the Metropole Orchestra conducted by Jurjen Hempel and myself rehearsed TUWP. This was obviously a fascinating process and I enjoyed every second, and it seemed to be an enjoyable experience for the orchestra as well - many of the musicians were kind enough to let me know how much they enjoyed working on the piece. Jurjen was brilliant at getting fast results while rehearsing thorny passages, and came up with several useful orchestration ideas on the spot which Chris and I were grateful to implement. Chris and I had gotten very used to hearing the MIDI soundfiles over and over again, and it was a mindfrig of some proportions when we finally started hearing the music played accurately at rehearsal by the actual orchestra musicians. On the second day of rehearsals I felt the music peaking and that was probably my favorite part of the procedure up to and including the live performance: hearing the stuff just as it was beginning to come together as played by humans, and me playing along with it. Really exciting and fun. The situation for the performance at the Paradiso on June 8 was not as ideal - we had been very comfortable in our large rehearsal space, and having to fit everything on the smaler stage at the gig and deal with the many sound issues naturally changed the character of the music. Everything felt less controlled, a little bit alien compared to the rehearsals - but still a lot of fun of course, and unfamiliarity doesn't scare me anyway. Preparing all the music and dealing with all the details up to the gig distracted me too much from my role in the piece as guitar soloist, and my playing at the Paradiso gig was generally under par (I tried to find the best of it for use in Parallel Universe). The battery in my guitar died during the performance of "Room" (Dave Gregory reprimanded me later), necessitating a delay of several minutes before playing "Room" again (much better the second time around). Everything about the music felt better after the forced delay. I think the little interruption deflated the tensions of the event very nicely and everyone relaxed into the music a lot more. The performance turned out to be immensely enjoyable for me, and I believe for the orchestra and conductor as well, and the audience responded warmly. Co de Kloet has also told me that the reviews for the piece were in the main favorable, so all in all I consider the evening a success. Vernon Reid also played his own set with the orchestra that night, and I thought that the two pieces worked beautifully together and made for a very enjoyable night of music. Vernon and DJ Logic (who performed on Vernon's piece) were wonderful guys who I hope to get a chance to do more work with. In September we returned to Hilversum to make the album. This experience was an incredible treat. The music cohered in a way that the Paradiso gig had only hinted at. As Scott has written, the album was "recorded during a sunny, dreamlike week in Holland" - and it really did feel like a dream. It nicely balanced the fact that the first music I'd written specifically for the project, the flute passage, had originally come in a dream. Scott told me afterward that he'd never seen me happier than while we were making the album. Jurjen Hempel again proved to be a hugely capable and unflappable conductor. He is a beautifully dry character, and could come off as somewhat intimidating but his wit and wisdom are undeniable. (Favorite Hempel memory: him chewing on a huge cigar by the Paradiso bar after our performance, able to relax finally, smiling and entertainingly critiquing Vernon's set in a uniquely Dutch sort of way.) During the album sessions he moved from chart to chart dazzlingly, insisting on accuracy and giving us loads of different good takes to choose from. The Metropole Orkest is fantastic. The musical flexibility afforded by having a full-fledged orchestra with jazz/rock rhythm section, including electric bass and guitar, suited this music perfectly. At one session I announced that I wanted a small sub-section of the orchestra to come in the following day to record some improvisations. A member of the violin section, Herman van Haaren, asked if he could bring in his electric violin and play - I said sure. His playing on the middle section of "Four Slices Of Toast" gives a very tangy flavor to that piece and helped the album out a lot - thank you Herman! And I was delighted to work again with Bart van Leir, who'd been the trombonist for "Nonkertompf Live" in Groningen in 2001. His spirit is fantastic and it just bubbles from his instrument. It was decided that I'd overdub my guitars and electric piano parts once the orchestra sessions were complete; advisable for reasons of expediency and electro-acoustic practicality. It also meant that I could take extra time to get my parts done, but still there was much less time budgeted for guitar overdubs than I would normally have for one of my albums. The majority of the guitar overdubs were done in one day. I had brought my Strat with me, and hired for me were an SG, a Telecaster, a ES-335, and an acoustic (we didn't have a Taylor handy so I won't mention the brand...). Also a couple of different Fender amps, a Marshall stack and I think another Frankensteinian sort of thing that I don't remember the name of. And a nice old Fender Rhodes, which George Duke played briefly when he came to visit one of the sessions - I could still kind of feel him on the instrument when I recorded my solo on "Room" later that day. Choosing takes, sequencing, and pinpointing and digitally correcting errors in the performances took several days and was a shockingly enjoyable process. I was fairly stunned when I learned that the album was going to be recorded in Pro Tools, but when I saw Gert de Bruijn remorselessly hunting down mistakes and making them go away while still leaving the music sounding natural and unaffected, I was sold. Gert Jan van der Dolder is what is traditionally referred to as "balance engineer," a not terribly descriptive title. What he would do is read the score while we were listening to the different takes, and if he or I heard a mistake, he'd instantly locate the transgressor on the written score, tell Gert de Bruijn from which orchestra section the offending note or passage was emanating, and de Bruijn would hunt it down in Pro Tools and make it right. This was howlingly fun and there was laughter constantly, which helped us get through the long arduous days of what could have been stressful work - we were on a strict deadline and we knew it, and I was pushing them hard, with a million demands for balance adjustments and clam removals. I loved this process so much. There's a little hotel in Hilversum where we always stay when we're there. I have a room on the second floor in the front, with a balcony where I love to sit and listen to birds and bicyclists. When I got the final mixes for the album, I opened the double doors to the balcony and stretched out on the bed, looking outside while listening to the album for the first time. The first time hearing a finished album is always pretty special; this was completely otherworldly, the most intensely pleasurable first-time album-listening experience for me ever. I felt overwhelmed by gratitude. So I gotta sing, dance and otherwise convey deepest thanks to Co, Scott, Oppy, Peter Van Hoogdalem, Jurjen, Gert and Gert Jan, the Metropole Orkest, everyone involved with NPS and the Metropole and the Paradiso and everyone who's heard the music...thank you, all of you, for making TUWP a reality and for an immensely educational experience. Let's do another one! 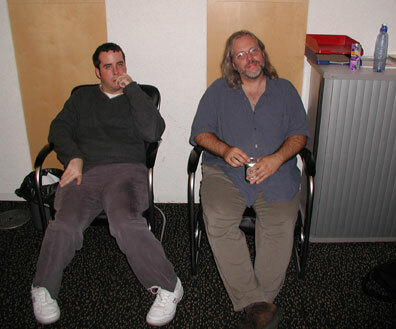 HILVERSUM, THE NETHERLANDS, June 5, 2003: Chris Opperman and Mike Keneally await a 4FM Radio interview with Co de Kloet. When MK and I had our first meeting to get together to discuss a game plan for accomplishing what would eventually become The Universe Will Provide, our first order of business was to sit down and discuss what Mike would like to accomplish with this piece. So I interviewed Mike for about an hour and a half and really picked his brain about a lot of things because I wanted to be on the absolute same page as him from the very beginning. In 1968, he saw '2001' in the movie theater. He was fascinated by outer space because it was blue and it had an endless sky and displayed infinite possibilities. He thought about the future a lot, and knew he wanted to be 'up there' somehow. He really strongly relates all of those feelings to the color blue and whenever he thinks about the future, he thinks about the color blue. Once he got his electric organ, he was fascinated by the psychoacoustics of it. He would put on his headphones and experiment endlessly with the drawbars and trying to make weird noises with the reverb and the percussion effects on it and everything. Anyway, eventually he had this dream and it was the best dream of his life and the lighting in the dream made everything look very different. It made it look like the way things look like in that kind-of lighting (he couldn't really describe it to me because he said it was the kind-of thing he'd have to show me for me to really understand). He said that when he started seeing lights during the Zappanale concert when he was jamming with Project/Object that it was the first time he had seen that kind-of lighting in life. Like obviously reality was reality but he managed to straddle the line between reality and his dream world. That moment really affected him in a profound way and I personally think that's what inspired him to take this direction for the Metropole piece. I asked him how cognizant he was of Vietnam growing up during that time and he told me that he was pretty oblivious to it but that he sensed that it was very wrong and that killing people was very wrong and he couldn't understand why people had to kill each other. He also sensed that Nixon couldn't be trusted although his father was a huge Republican and a Nixon supporter. But MK also felt a kinship with the counter-culture type people, hippies, musicians, satiric comedians, etc. He said he could sense that they were enlightened somehow and built a very strong anti-war sentiment although he didn't really yet understand the subtleties of war. I jumped right in with my Word document writing up the instrumentation to MK's specifications. I made a separate # for each individual in the orchestra, and although MK was initially #51, I changed him to 26 because there are exactly 25 string players so it made it easier to line everything up that way. However, first we had to decide on a font to use, so I scrolled through every font that I have and he made me do it in time! So even if WingDings or something came up, I had to give each font their equal time in the sun and we eventually made our choices, so everything in the score and parts will be written using Perpetua for all 10 movements. So while I was trying to work up a fake score to start working with, he called Jesse and Sarah and said goodnight to them. Then he came back and decided that it was time to start working on the piano. So he went to the keyboard and started trying to channel some energy, but nothing was coming to him. So he asked me where East was and I thought for a second and I was like, 'Oh, it's over this way' and pointed towards the pool. So he asked me if we could turn my keyboard so that it was facing east instead of west because nothing was coming to him from the west. By the end of all the tweaking, all the lights were out except for the dim of my computer screen, candles were lit in various strategic places around my apartment, he was lying back on the futon with his feet underneath the keyboard (so he could sit up at will and start composing) and I was lying face-up on the floor trying to use mental energy to help bring this flute melody he once heard in a dream back to life. Scarily enough, once that vibe started within a minute and a half I started hearing this bizarre flute music in my head and he sat up and started playing it. So I went over with my pen and sheet music and started trying to write down what he was playing as he was playing it. Then on the third and fourth flute parts he wrote this really bizarre rhythm that neither of us could figure out, but he simplified it and then I got onto the computer and started working. The rest of it seems like a dream. It's weird because I barely remember most of it now. It all just seemed so natural and so right and it was like I was there doing it, but I wasn't really there at the same time. And the whole vibe was like everything we were doing was what we were meant to be doing. We spent maybe two hours on the first two measures of the piece and although it was obviously his thing and I was there to write down his music, he really gave me my own space and let me play with the things and tweak the rhythms and stuff. However, I never felt like I was intruding or forcing my will; it all seemed like it was part of the natural flow of things. And we were so meticulous. There was these sextuplet rhythms and we spent over an hour making sure that they all crossed correctly and we shortened the trills and changed the notes of things and durations and dynamics. But all the changes were very subtle, like the quiet evolution of a thousand generations. This was the only time we experimented with the position of the keyboard and everything, mostly because we had a whole lot of work to do!" Source One) The Finale computer music files which Oppy and I listened to while preparing the charts. As Oppy would input the music into Finale music notation software, we were able to hear the music played back, in mono sound, using the internal sound card in Oppy's computer. For Parallel Universe, in July 2004 we remixed and remastered these Finale files at TAR Studio by playing them through Oppy's Korg Triton keyboard and into Pro Tools. We were able to use the superior keyboard samples in the Korg, and also used the onboard mixing capabilities of the Triton to specify distinct stereo placement for each of the sixteen channels. 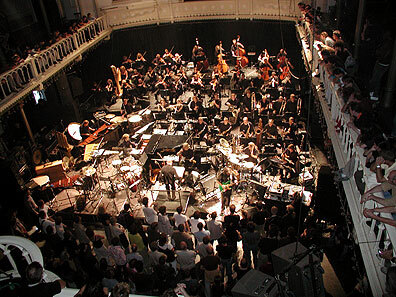 Source Two) The live recording of The Universe Will Provide, performed by me and the Metropole at the Paradiso in Amsterdam on June 8 2003. Source Three) Studio outtakes from the Universe Will Provide album sessions, Hilversum, September 2003. Source Four) Audio soundtrack excerpts from video footage shot by Scott Chatfield and Chris Opperman during the whole process. Plus a little bit of audio done on Pro Tools in TAR Studio at Chatfield Manor. Parallel Universe hops, higgledy-piggledy, from one of these sources to another constantly, sometimes layering more than one of them simultaneously. Below is a song-by-song guide to where all this music comes from, with background information of varying degrees of relevance. Finale MIDI file. This is an attempt to recreate dream flute music. I had the dream in the early 80's, and it was about Michael Mantler's album The Jazz Composer's Orchestra (from 1968). At the time of the dream I hadn't heard the album yet - when I finally heard it, it sounded nothing like this (I don't think there are any flutes on it at all - haven't heard it in years). So it was fun to try to recreate the music, since it seemed like the only way I would ever get to hear it. This flute passage was eventually used for the beginning of the TUWP track "Not Just Flutes." Studio outtake from TUWP. This is from the second of three improvs recorded with a sub-section of the Metropole; this session was convened to get material for the middle section of "Four Slices Of Toast" on TUWP (for which I ended up using most of "Studio Improv 3"). From the live performance at the Paradiso. For a few seconds after 3:35, you can hear a little of "Studio Improv 2" still playing simultaneously with this live excerpt. Finale MIDI file. A small piece of writing unused for TUWP. Finale MIDI file. This is the original piano improvisation, from which "Mwah Squared" on TUWP was orchestrated. Finale MIDI file. This is part of an early version of "Four Slices Of Toast." From the live performance at the Paradiso. From 1:05 - 1:42, you can also hear sections of the MIDI "Piece of Toast" file playing along with the Paradiso recording - for instance, on the fast trumpet lines starting at 1:18, you can hear the real trumpets from the Paradiso on the left channel, and the MIDI trumpets on the right channel. Some guitar from the Paradiso "Four Slices Of Toast" can be heard playing along with this MIDI file for the first few seconds, and makes a little cameo appearance in the background at 4:18. At the end of this small chunk, a solo guitar enters and continues through the entire next section - my guitar here was overdubbed in Pro Tools at TAR Studio in Leucadia, July 2004 (engineers - MK and SC). This was a fun overdub - I played direct into the computer and tried using a plug-in amp simulator but it wasn't happening. So Scott suggested using my direct solo, but running out of the computer, into my Rivera amp, mic'd up and sent back into Pro Tools. Hearing the solo playing itself coming out of my amp was eerie but distinctly enjoyable. From the live performance at the Paradiso, this is part of the improv from the middle of "Four Slices Of Toast." Starting at 8:15 or so, through to the end of the piece, the trumpet and sax solo sections, which were actually performed one after the other at the show, are layered so that you're hearing both sections simultaneously. Voices: Co de Kloet, Josephine Veldhuyzen, Mike Keneally. We were standing in a parking lot and Scott was circling us with the camera. Finale MIDI file. Piano improvisation, to provide source material for TUWP but unused. Orchestrated as a virtual piano/marimba duet during the July 2004 Finale file mixing/mastering session with Oppy. Opperman chasing me with a camera through the hallways of MCO 3 studios in Hilversum during the TUWP sessions. At the end we enter the control room where "Room" is being listened to by the engineers. Finale MIDI file. The beginning of this overlaps with the end of the last section. This is Chris Opperman's scary re-orchestration of the main "Room" theme which he thought might find a place in the final TUWP selection (the title "Rejected Room" indicates my feelings about that). Video soundtrack excerpt. This is footage of the string section of the Metropole doing an overdub during the TUWP sessions; on a couple of songs we overdubbed additional strings onto the complete orchestra recording, to strengthen the sound of the section and to clarify passages needing help. Another video soundtrack excerpt from TUWP string overdub session, playing simultaneously with the "All Of Them Were Quiet" demo until that cuts out at 5:35. Video soundtrack excerpt. This is me messing around on Co's piano. I thought the figure I was playing sounded kind of spooky layered with the "Bullies" string overdub. Finale MIDI file. This insinuates its way into the mix as the "Bullies" string overdub continues scraping along. Video soundrack excerpt. Me, during guitar overdub session, being confused. Video soundtrack excerpt. String overdub on coda of TUWP track. Some of the orchestration on the completed TUWP is very dense, so it was especially fun for me to include fragments like this on Parallel Universe, allowing a closer listen to some of the counterpoint which is kind of hidden in the score. Finale MIDI file. Very early psychotic version of the ending of "All Of Them Were Quiet." TUWP studio outtake. This is the first of the three improvisations recorded during the "Four Slices Of Toast-middle improv" session with the smaller group. The section from 0:43 - 0:56 was used on TUWP at the end of "When Drums Dream." Finale MIDI demo. Edited excerpts from the demo of "Bullies," including a number of passages edited out of the final version. From the live performance at the Paradiso. Opperman and me in Scott's hotel room, singing along with a CD of a rough mix from that day's studio sessions. From the live performance at the Paradiso. My utterly inexplicable guitar performance on this piece is part of what convinced me not to include guitar on the studio version on TUWP. Finale MIDI demo. Yet more excerpts from this unused composition - Oppy and I must have put together ten different versions of this song, only to run out of time to complete the orchestral version during the studio time booked for TUWP. Herman confirmin' that I'm happy in the hallway in Hilversum. He's happy too. We're happy! TUWP studio outtake. The end of this performance (the five sad-sounding chords) was also used as the beginning of the middle (improv) section of "Four Slices Of Toast" on the TUWP album, whereupon it switches over to "Studio Improv 3" (with Herman's outrageous violin soloing). Video soundtrack excerpt. This is Co de Kloet on saxophone and me on piano, improvising in Co's front room. Oppy's running the camera and laughing when the music sounds especially good to him. Scott and Josephine are in the kitchen, banging silverware around. Pro Tools demo. I did this in Tar Studio sometime early in 2002, while I was beginning to work on some songwriting demos for the Dog album. The vocal melody was improvised, then doubled, then all additional orchestration placed around it. I later decided to use a simplified version as the opening movement for TUWP. It was a pretty sudden, unexpected decision to make Parallel Universe at all - feels like it happened almost accidentally. We're very happy with the results. I hope you find it a saucy listen.